This Saturday marks Motherwell FC's FOURTH trip to Hampden in remarkable season! This Saturday sees Motherwell FC make an incredible FOURTH trip to Hampden Park this season, as they face Aberdeen in an eagerly anticipated William Hill Scottish Cup semi-final, kick-off 12.15pm. Should ’Well be successful against the Dons, that impressive tally will be increased to five visits come the final against either Celtic or Rangers on Saturday, May 19. Here, we look back on the Steelmen’s previous three visits to Mount Florida in the 2017-2018 season, which mostly make for pleasant reading for ’Well fans. Way back on July 15 last year, just 1590 fans were in attendance in the rain as the Steelmen thrashed Queen’s Park 5-1 in a Betfred Cup group game thanks to goals by Chris Cadden, Craig Tanner, Louis Moult (remember him?) and Ryan Bowman (2). After successfully qualifying from the group stages, Motherwell then faced Rangers in the Betfred semis at Hampden on October 22, with two Moult goals (the second of which was a Goal of the Season contender from 25 yards) silencing the huge Light Blues support and sending ’Well fans in the 44,506 crowd into raptures. Another notable match incident saw ’Well striker Bowman breaking Rangers defender Fabio Cardoso’s nose in an aerial challenge, with flop Gers manager Pedro Caixinha being sacked just three days later after a 1-1 home league draw against Kilmarnock. 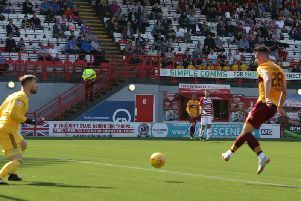 Motherwell – led superbly by gaffer Stephen Robinson and progressive thinking chief operating officer Alan Burrows – then suffered their one defeat at Hampden this season in a 2-0 Betfred Cup final loss to Celtic in front of 49,483 fans on November 26. The match hinged on referee Craig Thomson’s dubious decision to send off Motherwell defender Cedric Kipre and award Celtic a second half penalty after Kipre’s innocuous challenge on Scott Sinclair with the Hoops leading 1-0. Moussa Dembele slotted home from 12 yards on the hour mark, with Thomson’s decision effectively ending the game as a contest.